The other big milestone, in terms of what I've been writing, that I hit in 2013 was getting solidly underway on Banshee. Banshee is a project that's been stewing in the back of my mind for a long, long time, and has gone through several permutations in that slow cooking process. Part of the reason I took such a long time to get around to this is the little promise I made to myself to finish the first books of my four "Maradaine" series before I really moved on to a new major writing project. I'm not entirely sure why I felt I had to do them first, but that's how I felt, but on some level it was probably a good thing. Because the Banshee I would have written several years ago is not the work I'm writing now. Not even remotely. Essentially everything except the central character (Lt. Samantha Kengle) and the name of the ship (and only tangentially) is different now. And in the older versions, Lt. Kengle was more the nominal lead in an ensemble, and now she's in the central spotlight, the only POV character. Part of that had to do with the worldbuilding. I started the Space Opera setting that Banshee lives in way back in 2002, but it's evolved and grown a lot in the past eleven years. As have my writing skills. My first attempts at Banshee, some of which reached nearly 50,000 words, were all wrong. Essentially fanfic for a universe that only existed in my head. It was only after I really started to interrogate what the story was, and who it was about, and why it was about them, that the pieces really came together. When I shipped Way of the Shield off to the agent, Banshee was really ready to go like gangbusters. And in about three months, it's about two-thirds to three-quarters done. Not too shabby. So that was 2013, which turned out to be a pretty good year for my writing. And I have a very good feeling that 2014 will turn out even better. The next big milestone of accomplishments in 2013 as finishing the draft of Way of the Shield, cleaning it up and sending it off to the agent. He just recently sent it back to me, so now I've got a last round of tweaks and polishes to put on it before sending it back to him to put out into the world. Long time readers will be aware that Way of the Shield was something of an albatross around my neck for much of 2012. I was working on it and it simply wasn't coming together at all. I had actually decided to put it to the side and focus on other things early this year, but it kept poking at me until I cracked the problem I had been having with the antagonists. It actually came together when my beta reader/sounding board guy asked me a simple question regarding Way of the Shield, and that brought about a breakthrough in writing out a long and complicated response. Doing that brought me from a manuscript languishing at around a third of the way done to complete in two months. Breakthroughs can work like that. The other thing I did with Shield, both in the original draft and again in the current clean-up, was confound the gender expectations of the old knightly orders that Dayne is a part of. Druthal and Maradaine are hardly a paradise of gender equality, but I wanted the Orders to reflect the idea that anyone who gets through the training process is considered an equal. But my first chapter had no female characters. Go through the projects you're already working on and change a bunch of the characters' first names to women's names. With one stroke you've created some colorful unstereotypical female characters that might turn out to be even more interesting now that they've had a gender switch. What if the plumber or pilot or construction foreman is a woman? What if the taxi driver or the scheming politician is a woman? What if both police officers that arrive on the scene are women — and it's not a big deal? And it stuck me, if I've already established this idea that the Orders have more gender equality than the culture at large, then why not just have Dayne's chapterhouse master in Lacanja (the city Way of the Shield starts in before Dayne returns to Maradaine) be a woman? I never gave Master Thall a given name, male or female, to begin with, so rewriting the scene involved little more than some pronoun switching. But, I think, it will have a strong effect on the worldbuilding of the Orders, which will ripple through the rest of the book-- which already has many female characters in a variety of roles. Regardless, as I mentioned back in May when I finally finished the draft, it felt very good to get this particular project out of its long, slow, "work-in-progress" state. I haven't ever really talked about the story itself, as it didn't seem appropriate when I first sold it. When it was coming out, it made more sense to talk about the anthology as a whole. I should preface this by saying I'm really not a short-story writer. It's just not a format I have a lot of affinity for, and I don't tend to write them without a specific purpose or plan. However, "invited to submit to this anthology" works very well as a specific purpose or plan. So, I received the invite and remembered a nugget of an idea that I had had for a sci-fi story. It was little more than this: A sci-fi future with a large interstellar, multi-alien community, but Earth isn't a part of it. Earth is the place you leave to have opportunity. Earth is Mexico. I did some research into border crossings, the lengths people go to in order to get in the States. I thought about "coyotes"-- those who "help" others get across the border, and the methods they use to do it. The conditions people will submit themselves to, the trust they will place on those bringing them, and the hope that when they emerge on the other side that an opportunity will be there that will make it all worth it. And I wanted something in there that could be a direct allegory to swimming across the Rio Grande. Thus "jumping the black"-- where the smuggled humans, freshly awoken from the paralytic "sleep" they were put in to avoid getting noticed by the scans-- have to leap through empty space from the smuggler's cargo hold to a port left open on the space station, so that they're off the smuggler's ship before his cargo gets inspected. If the humans jumping don't make it safely... that's their problem. Also, if they get caught right when they get in the station, their problem. I really enjoyed writing this, and it definitely clicked one big button for me: I could write a lot more of it. I kept it at 4000 words to make it fit easily in the anthology, but I could easily expand the story to novella length, building out what happens next once the humans make it off the rock. But, as I said, selling that on January 1st was an excellent way to start 2013, and I was quite pleased to see it in print in September. *- My story for The Norton Anthology of Hint Fiction was paid at over a dollar per word, but it was only 21 words long. Twenty-two with the title. But it wasn't genre. This week's work on Banshee brought me to an interesting point, somewhat unintentionally. In brief, my main character, Lt. Samantha Kengle, was injured on a mission (a nasty creature managed to bite her on the neck). She loses consciousness, and when she comes to, she's being treated. Initially I wrote that she would wake up with her uniform coat off and one of the aliens pressing her hand to Kengle's bare chest. (Said alien can essentially function as a living diagnostic scanner). But then it hit me about the unintended implications behind that. Sure, it's medical, but the point is my one female human character gets stripped down while unconscious, and wakes up being groped. Sure, groped in a medical fashion by a female fish-alien, but still. I had put in a layer of sexual vulnerability that I had never intended, and it rested largely on the word "chest". I re-thought the scene. I needed the alien to be able to get at bare flesh and the injury, but keep it professional. Leave no doubt, no subtext, that what was happening was anything other than medical treatment. So I changed "chest" to "clavicle". Made no difference in terms of the text of what was happening, but pulled away the subtext I wanted to avoid. I'm not going to get all, "words are important, words have power", because I'm sure you all know that. But word choice is crucial, and sometimes we make strange choices-- subbing in a not-entirely accurate synonym to avoid repetition, going for an uncommon word to avoid a common one. And sometimes the words we choose have unintended consequences. Fortunately, this time, I think I sidestepped it. But there may be other ones that I'll fall into. Folks: Christmas is coming, and I'm busy keeping balls in the air this week, so let's keep this short and sweet. What are you giving your Science Fiction reading friends and family for Christmas this year? 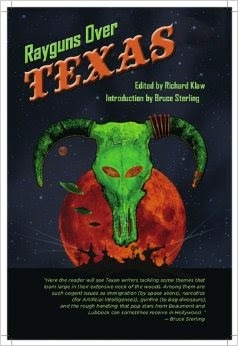 Consider the merits of giving Rayguns Over Texas, a compilation of science-fiction short stories entirely by Texas writers. It's quite an impressive line-up of writers and stories, if I do say so myself. “TimeOut” by Neal Barret, Jr. If you're still not convinced, then you can preview every story here. Let's talk for a moment about Marvel's Agents of SHIELD, possibly the biggest disappointment of the current season of television. And it was the biggest disappointment because the expectations were set high: take the biggest hit of big screen of 2012, a movie which successfully integrated the worlds of multiple movies to create a mega-star movie, and have the acclaimed and beloved writer/director of that movie helm a new show to explore the deeper nooks and crannies of the greater Marvel cinematic universe that a movie couldn't take the screen time to do. If I may be so bold, I'd suggest that it failed with its hooks. Namely, it treats its characters as its biggest hooks, when those characters are not hooking the audience at all. And it feels like it considers it's big hook-- its setting-- as more of an albatross than advantage. One of the executive producers was even quoted saying something like, "You shouldn't be looking for easter eggs". Now half a season in, its somewhat clear that what we are seeing is not the "growing pains" of a genre show finding its feet. Rather, we're seeing the very show the creators want to do: in essence, a brighter, less skeptical* X-Files. Now that's always the challenge a writer faces: that the characters that you love, these hooks that fascinate you... well, that it's just you. No one else is going to invest in it like you do. And this is especially true with genre writers. We spent hours upon hours drawing maps and hashing out centuries of history. We are deeply, deeply invested in our work, even if the quality of the work itself doesn't match the passion behind it. I can't tell you how many manuscripts I've read for critiquing purposes that, while the writing didn't hold up, the love was practically pouring off the page. I didn't get into the story, but I knew that the writer was utterly in love with it. And, frankly, the craft can be improved, if the love is there. *- By "less skeptical", I mean when they're investigating hovering bodies or apparent telekinesis, they approach it as you would in a world where superheroes beat off an alien invasion in downtown New York: as the sort of thing you have to accept happens now.